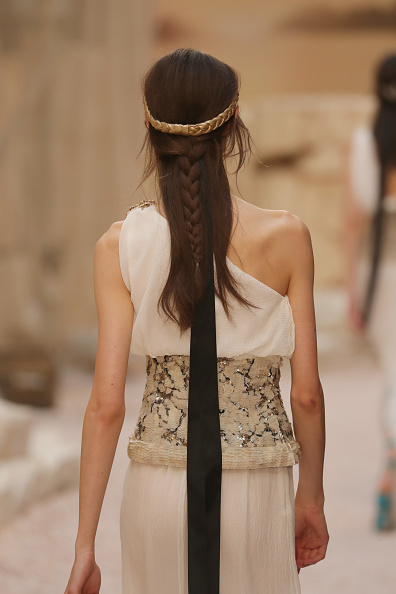 Karl Lagerfeld hath spoken: this summer, the “it-girl” beauty trend will be Grecian goddess hair. Making a clear departure from his Fall 2017 space station runway, Mr. Lagerfeld took Chanel back in time for the esteemed fashion house’s Cruise 2018 collection. As in, all the way back to ancient Greece. In an elaborately reimagined temple of Poseidon created inside Paris’ Grand Palais, models wafted down the runways in goddess-like getups and mythical ensembles. And while the cruise threads will no doubt set the sartorial tone for the coming seasons, it’s the dreamy Grecian goddess hairstyles that are going to have an immediate impact. Crafted by celebrity hair guru Sam McKnight, the romantic styles fused long tousled tresses with tiara-like headbands and regal adornments. Basically, the Grecian hairstyles were just plain dreamy and delightful. And the best part of all? With the proper headbands, we can ~totally~ recreate these looks at home. These Helen of Troy-inspired styles just gave a certain effortless je ne sais quoi, no? Ahhh! We just love the ease and elegance of these hairstyles. And like we said before, we can *probably* pull this look off all by ourselves, which may be the best part… although is Mr. McKnight wants to throw us a few expert hairstyling pointers, we’re all ears!